"The H-R diagram. I think is really interesting you can get so much information from something so simple." "The Coulomb barrier--I pictured trying to put two magnets together and pictured that little forcefield around them when you try to make them touch." "The concept of fusion is definitely interesting, because fusion of hydrogen requires a temperature hotter than the core of the sun, yet fusion can happen because the immense pressure forces them together. Really cool." 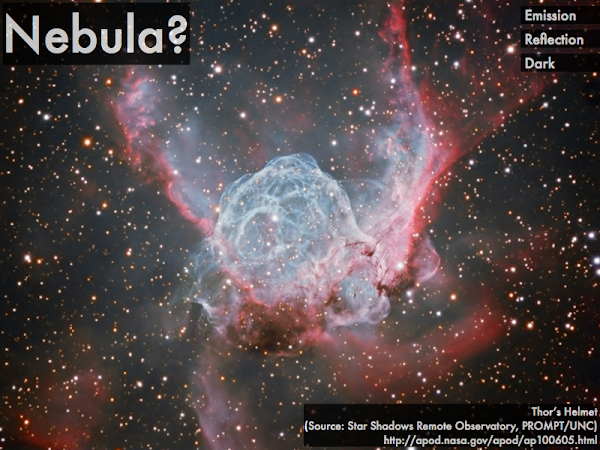 "You can kind of tell what a nebula is made of by its color." "NEBULAE! I always see these nail tutorials and they say, 'How to Make Your Nails Look Like Galaxies' but they should really be called 'How to Make Your Nails Look Like Nebulae.'" "That stars can be born at the same time, but age differently. The house party model used to describe how stars become main sequence stars was helpful." "That about 90% of an average star's life is spent on the main-sequence. I didn't really know how long the main-sequence portion of its life was." "Star life cycles. Also, the house party model was very cool and actually pretty accurate and on point." "The explanation of star cluster ages as a house party because it helped me see similarities and grasp the concept better." "The house party model is actually hilarious and I love it." "How there are stars that are both hotter or colder than the sun, while both being smaller or larger in size." "The H-R diagram was a little hard to understand due to the placements of the variables but after some hard thinking I got it." "Parts about cold and hot fusion, and I tried looking it up but there were really confusing explanations to go along with it." "Fusion rates were kind of confusing for me. Also, the H-R diagram was difficult for me as well." "How mass and temperature affects the rate of fusion confusing. I need some more explanations." "The star cluster ages an were confusing until I read the house party model. Is it dumb if it works?" "It all seemed pretty straightforward, honestly." "The protons must be under pressure and in heat in order to produce energy, without the adequate heat the protons can't hit each other." "Cold fusion would be implausible because hydrogen only gets squeezed a lot when under very high pressures and temperatures, which causes fusing and energy release. This couldn't happen without high temperatures." "Hydrogen won't be moving fast enough and due to that they won't be colliding as much and less violently so they might not be able to overcome repulsion." "Atoms need heat to be able to move fast." "Um, I don't know--if it's cold, there's no friction, no friction equals no fusion? That's wrong, I know it is--I just don't want to re-read the presentation slide again." "There was a lot of information in this section, so I'm not sure what I'd want to ask. I'll figure that out over spring break." "Need more explanation on the birth of stars, please." "Are you a punctual person for parties?"